Cheesemaking is mentioned several times in the Old Testament, as well as in Homer. Chances are King Tut enjoyed cheese as well. The tombs of the Egyptian Pharaohs show traces of what is believed to be cheese. Did you know that wine and cheese parties (80s flashback alert!) are enjoying a renaissance? 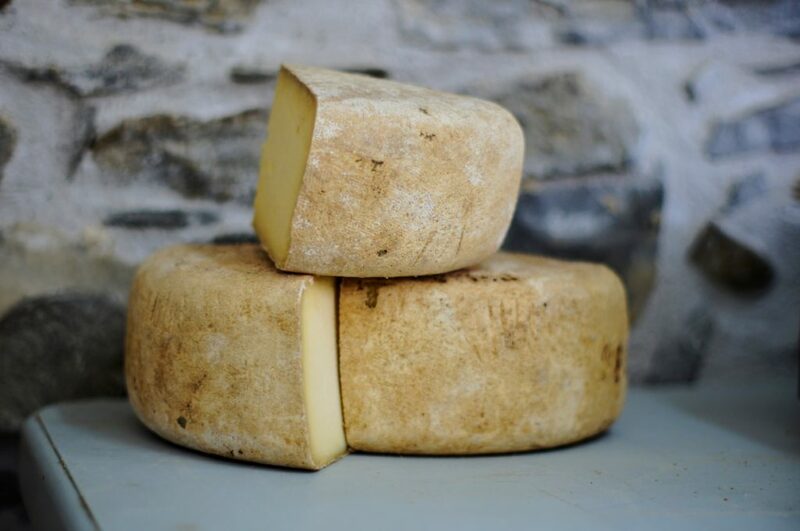 But instead of pedestrian cheddars and sneaker-brie, folks are indulging in a cornucopia of amazing cheese flavours from Ontario, Quebec, Spain, France and, of course, the US. Gourmet grilled cheese sandwiches (sourdough, rustic, multi-grain, focaccia, Challah or flax seed bread topped with an alphabet-choice of Boursin, brie, buffalo mozzarella, Cambozola, Emmental, fontina, Gouda, gruyere, smoked cheddar or Swiss). There’s something very comforting about a warm fire and a chilled glass of Niagara Reisling accompanied by a slather of creamy Riopelle de l’Isle cheese oozing into a warm slab of baguette. Which brings me to the next item – soup. Now’s the perfect time to get out the crock pot/slow cooker/Instant Pot and assemble farm fresh ingredients for a pot of warm autumn soup. How about Curried Red Lentil and Swiss Chard Stew? The recipe calls for a can of garbanzo beans/chick peas, but I made a pot today and I think the beans would be too much of a good thing, because the soup is thick and hearty and warming. I used white onions from Hope Farms, sweet green and red peppers from Niemi Farm and added a few tablespoons of Patak’s mild curry paste. The paste gives it a bit of bite and makes a nice counterpart to the bright green chard I bought from Summerside Farms at the Market a while back. With apologies to Omar Khayyam: A fresh-baked loaf from Vince’s, a wedge of buttery Canadian cheese and a bowl of thick, hot homemade soup…. This award-winning short produced in 2012 for The Guardian newspaper in the U.K., contains eerie echoes of the turmoil in social media and traditional press reporting today. Professional journalists are under fire (literally). Informed coverage and balanced speech are under attack by the purveyors of you’re wrong-I’m right-speak. The thing is, it’s usually the edited spin-offs, reposts and tricked-up memes that twist and convolute genuine news stories into something totally different. As corny or over-the-top as some of Oprah Winfrey’s programs were (a car for everybody! ), she did interview many amazingly talented folks over the years. This one, with Brene Brown, touched on the topic of bravery, a trait we tend to associate with grand acts rather than the simplicity of soldiering through our day-to-day lives. But we are all brave, in our own way! I’d forgotten how much I enjoy TED Talks. In my never-ending quest for inspiration (and yes, as a way to not work on projects that have stalled), I look at a lot of pictures, always searching for that illusive ‘something’ that will help me when I blog. I’m a compulsive downloader of images from Pexels, Pixabay and Unsplash. Some pictures inspire me, some as simply beautiful and some are quite surprising for many reasons. Here is the description of a funny, thought-provoking talk about how we, as readers, develop unique skills – we can see a combination of lines and letters and ‘fill in the blanks’ to shape images and stories in our minds. Without realizing it, we’re fluent in the language of pictures, says illustrator Christoph Niemann. In a charming talk packed with witty, whimsical drawings, Niemann takes us on a hilarious visual tour that shows how artists tap into our emotions and minds — all without words. I love his descriptions of the creative process and our ability to be inspired by image. Now go look at some art and photographs and let your mind burst out of it’s tidy rut for a while!